An accident in a hotel has left the Scot debilitated. But he's not alone in the pro peloton. Don’t be surprised if you don’t see David Millar in so many breakaways this year. The poor fella has lost his sense of smell. How now is he going to be able to sniff out the right move? The 37 year old, who is set to retire at the end of the year, said it happened after a freak accident in a French chateau hotel earlier this year. Maybe ‘freak’ is not the right word. It’s a small wonder that similar such accidents are not more more commonplace amongst pros. “I was walking through the hotel looking at my phone,” explained Millar over a fragrant morning coffee in another hotel in Mallorca last month. During the course of this conversation, a steady stream of professional cyclists who’d been competing in the Challenge Mallorca had strolled in and out of the vast breakfast room. Most had eyes glued to touch screens, thumbs scrolling up and down – counting likes on their latest Instagram and sending texts to loved ones. Such is life on the road. “I know,” said Millar, when this trait of professional cyclists was mentioned. Millar explained he had been at the chateau working on the Stephen Frears’ film about Lance Armstrong. He’d come on board as a cycling consultant helping guide the production through the finer nuances of professional cycling. 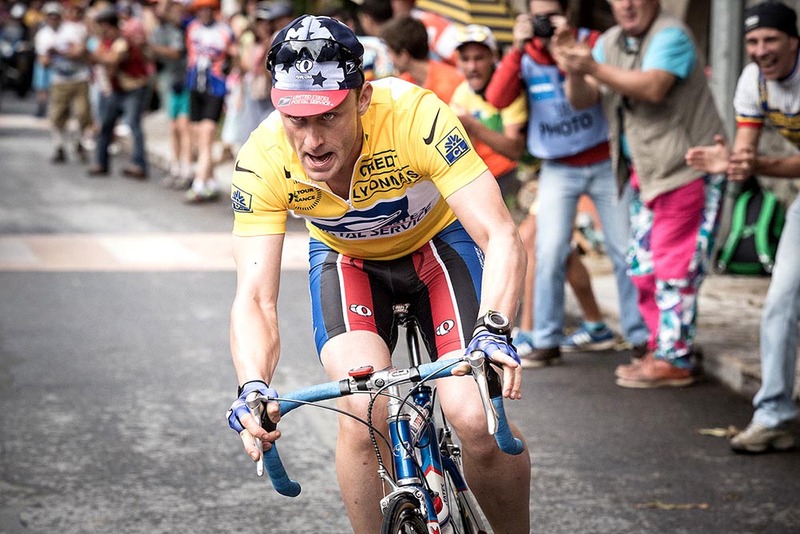 Maybe you’ve already seen the press shots of a yellow jerseyed Ben Foster astride a 1999 Trek. From the chunky heart rate monitor and Cinelli quill stem to Oakleys perched on his head, the attention to detail is stunning. But strolling, scrolling, through the chateau, Millar’s distracted eyes missed the not so small detail of a low slung beam. Crack! He smacked his head. When he reached up he felt blood. Then he passed out, possibly knocking his head again on the way down. Armstrong always did have a way of getting to people who displeased him. This was his comeuppance for working on a film about Lance, Millar joked. Losing one’s sense of smell might not be the first thing you expect to happen after banging your head. But Millar had reason to be relatively unfazed. His Garmin-Sharp team mate Ryder Hesjedal also lost the same sense after a head injury back when he was racing mountain bikes. Funnily enough the pair were sharing a room in Mallorca, as they regularly do. Like the one about the dog with no nose (How does it smell? Bloody awful! ), there must be a good joke in there somewhere. Millar is only too aware of the potential pitfuls of the two sharing.